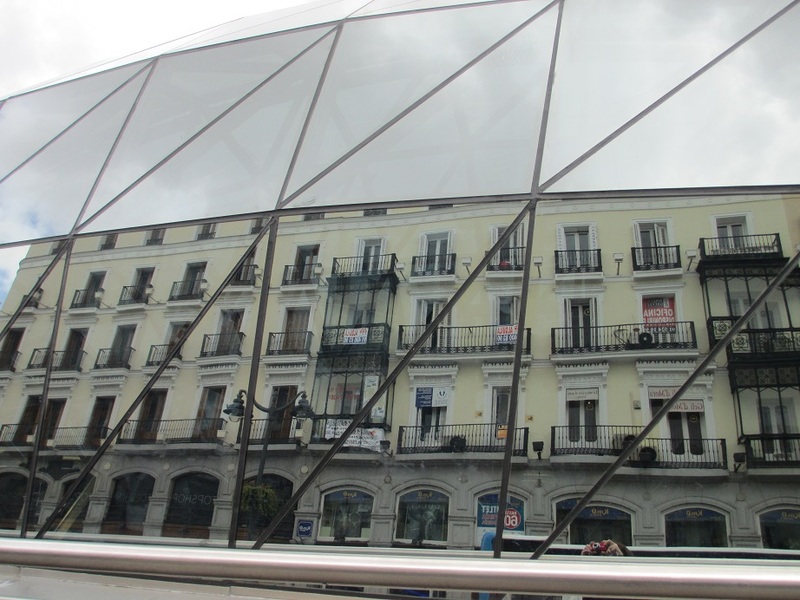 This entry was posted in Madrid, Spain, Travel and tagged Puerta del Sol, reflections. Bookmark the permalink. More great shots of reflections (so often tricky) like your window picture from Carcassonne, France. Much appreciated. Thank you – I thought that those reflections provided an interesting view of the buildings in the area! You’re so good at coming up with entries for these challenges! One of my favorite spots to people watch in Madrid. What a great place to people watch – it’s really lively! Especially when you have the time to enjoy everything! That sounds great – you must have good memories! I do, especially when there was Real Madrid soccer matches going on. It was wonderful to see that glass dome and seeing the reflections made it even better! There’s something about the way those clouds are reflected in the first photo that made me expect to see them moving. Nicely done! Very ingenious! I think it’s kind of cute that your red camera is in the picture. Thanks and I was surprised to see that camera – I didn’t mind though! Nicely Done!!! I love the Puerta del Sol square……..even more than Plaza Mayor….I think because of El Corte Inglés !! Thanks and I know what you mean about El Corte Ingles – I could spend hours there shopping and admiring all the wonderful merchandise (and food)! what a cool photo… love the different angles and images reflected. The glass showed so many different reflections – it was really fascinating. Thanks! Amazing reflections Meg – well captured with your red camera. How cool to have your camera in the shot. I was happy when I realized it was actually my camera in the picture!